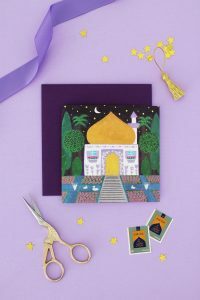 Paper Bag Eid Pouches – Hello Holy Days! Handing out money to children is a tradition of Eid – make these Eid pouches to carry on tradition. A bit like trick or treating, children go from adult to adult at family gatherings, greeting them a blessed Eid; in doing so, they receive a little bit of cash from each (prepared) adult. By the end of the night, they end up with quite a sum of money. For a fun way to hand out money, decorate paper bag pouches with a crescent moon and star, the symbol of Islam, and have kids personalize their pouches. In addition to money, you can throw in some lollypops, balloons, crayons or other small favours in their pouches for double the fun. Trace a circle onto cardstock and use to cut out a crescent shape. Make stars from cardstock using punch. Glue crescent moon and star in the center of the paper bag pouch. Have children personalize pouches, then fill with money and if desired, add in other small favours. TIP: If you have loved ones living far and wide, slip some money into the paper bag pouch decorated with the crescent moon and star; then place the pouch inside a mailing envelope with a leaf of stickers. Once the mail is received, children can decorate their own pouch with the stickers you sent along. The kids will love receiving their own mail.